Set of lifting appliances KOP4-100 is designed for lifting mine excavator for routine and emergency repairs on the strip-pit in the extractive industries. The system is designed to perform the pre-pressure power transformer winding during the repair work. The system complies with the requirements and instructions for repairing transformers. The set of equipment is designed for rescue and recovery operations, lifting, moving, alignment and installation of the wagons and rolling stock units on rails. 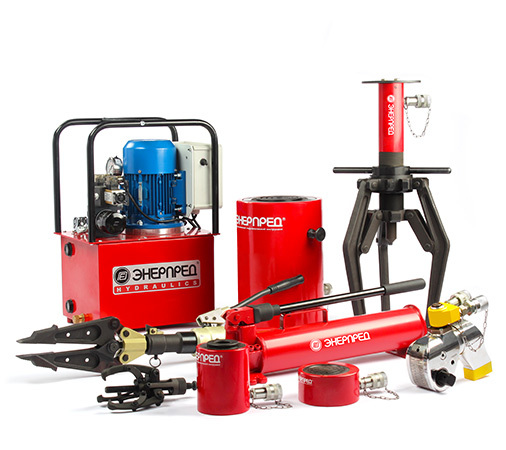 The use of hydraulic equipment and tools - one of the most effective ways of mechanization in the modern industry. The advantages of hydraulic equipment includes mobility, power, and electrical leakage, which is especially important when working in humid and polluted environment, as well as under water. Hydraulics is irreplaceable when required considerable effort. When moving on turnouts there are no problems with the passage of crosses and counter rails, and also maintains the speed of rolling out the rolling stock set for it. The TTL-25 trolley manufactured by your company is a good example of equipment for emergency repairs on railways. The basis of our success - people. Join a team of professionals! We'll review your resume and answer any questions. We invite you to mutually beneficial cooperation for the promotion of the tool marks "Enerpred" in all regions of our country and abroad. 1-st Mitinskiy per., 15, building 1.